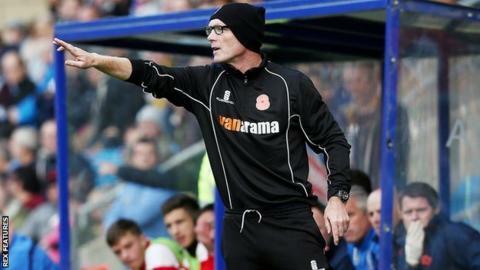 Gateshead have appointed former FC Halifax Town boss Neil Aspin as their new manager on an 18-month contract. Aspin, 50, replaces Malcolm Crosby, who was sacked after five months in charge on Sunday. Gateshead-born Aspin joined Halifax in 2009, but was fired in September with the club bottom of the National League. "Neil displayed all of the attributes and characteristics I was looking for in a manager," chairman Richard Bennett told the club website. "He has vast experience and knowledge of this league, a fantastic track record and a great eye for spotting talent." Aspin, a former defender, played more than 200 Football League matches for Leeds over seven years before leaving in 1989 to spend a decade with Port Vale. Bennett added: "Neil left Gateshead at the age of 16 to pursue a distinguished playing career before moving into management. "I was greatly impressed with his appetite for the job. It is a position he has craved for and now he has it."